Sorry if you missed signing up for the autumn swap 2018, but don’t worry. You are getting a new chance this spring again! If you want to be notified when the swap starts, please sign up for my Newsletter. Thanks for your interest. I started the twice yearly DIY Postcard Swap in 2010. 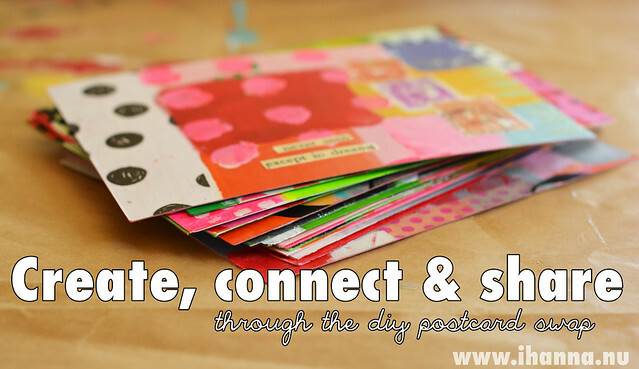 I created it because I love mail art, mixed media, handmade postcards and sharing creativity with my readers! I love getting surprises in my mail box – and I know you do too, right? The swap has grown to be a beloved feature of my blog, and many participate year after year. I open this international postcard swap up for participants twice a year; once in spring and once again in autumn. In this swap, you get to create something beautiful, spread the joy of creativity, and connect with people from all around the globe. Win win, right? Please note: The rules and guidelines are simple, but please read through this entire page, especially if this is the first time participating, and check the FAQ linked above if you’ve got questions. Thank you. I will send you the 10 addresses via e-mail before Send Day! If you can’t find them: Please first check your spam folder, your paypal e-mail address – and then contact me (after the 15th of November of course! ), thanks. If you did not receive your addresses it is your responsibility to let me know ASAP – and I will resend them to you, maybe on another of your e-mail addresses? You can also contact med through Studio iHanna‘s page on Facebook. The rules are simple, but please read through these rules below, especially if this is the first time participating. And then follow through on your part. You will disappoint a lot of people that will be waiting for your handmade postcards, if you don’t finish on time! Please note that this swap is not for children, sorry. If you have any questions not covered on this page or the new and updated FAQ page – feel free to then contact iHanna. This swap is growing every year and I love that, one year there were way over 200 participants! To be able to take the time to arrange it, I need to charge a small fee. To pay is easy, quick and secure. Your payment goes through the well-known site of Paypal. You can also pay with a credit card: Just click the paypal button and instead of logging in, choose card payment at the bottom of the page. You will make 10 postcards. Your choice of postcard size and style. Just remember no copies – just original art. Bought postcards are beautiful – but those are not welcome in this swap. Instead try to be artistic with your cards, and have fun while making them. DIY actually means “Do It Yourself”, and you can experiment with what you’ve got at home. 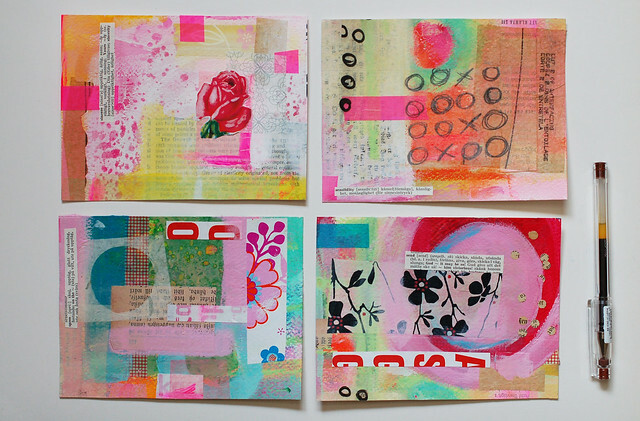 Try collage, mixed media, create flat fabric art, alter an existing postcard from your paper stash (! ), paint with watercolors or acrylics, draw a mandala, make a scrapbook style card, embellish, sew, paint, embroider, etc! I’ve got plenty of blog posts with postcard inspiration, all listed below. 4. Send your cards out on time! You will receive ten different addresses via e-mail from iHanna after the deadline date. You will get postcards from 10 other people. 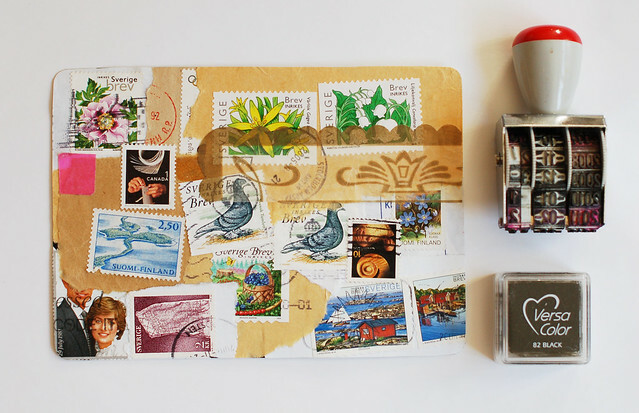 Finish and send your postcards in a timely manner, please. It’s not okay to let people wait several weeks after deadline! Simply get your postcards to the post office on time, thanks. See all dates above and Note the Dates in your Calendar. Detail on these ideas below, but just quickly: Invite your friends to be in the swap! Help spread the word by sharing the link button! Host a postcard party! Document your process! Share your postcards online! Blog about them! Add your postcards to the Flickr Group! 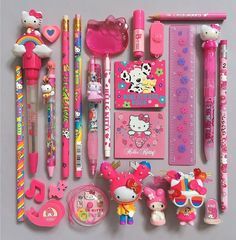 Comment on others images! 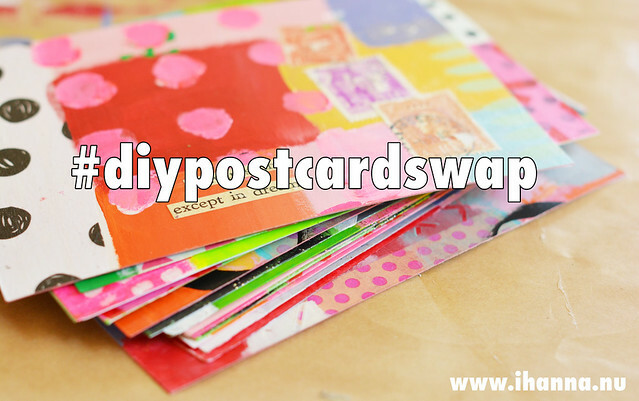 Use the hashtag #diypostcardswap on Instagram, Flickr and Facebook! If you want to be notified about the next swap, please sign up for my Newsletter. With a deadline you get a little push to create something special – right now! Why not make this swap into a postcard party and invite a few friends to create together? Mix up a few drinks, paint, get out the crayons and collage fodder and get to work! I bet you’ll have a wonderful time together. In past swaps I have invite my mom, cousin, and a few friends to sign up, because it is great fun to see what they create, to create together with them and then later see what they get in their mailboxes! Why don’t you invite your peeps too? If they don’t read this blog you can just ask them if they are interested and help them get signed up – just make sure they know the dates + rules of what they sign up for. 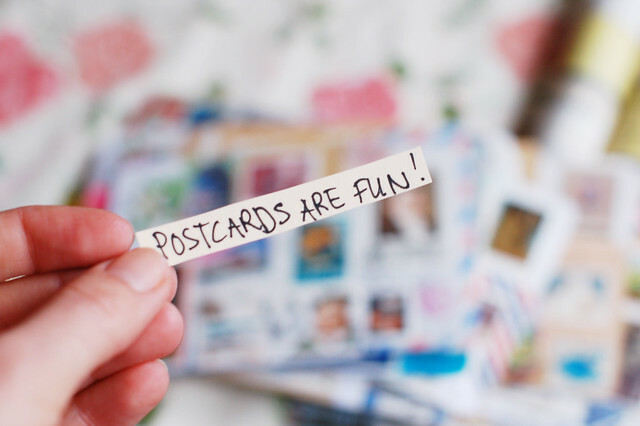 I love to know what your postcard experience was like, so feel free to always leave me a comment on the current swap post and tell me what it was like for you this year. Create, connect & share – that’s the swap slogan around here. I would love if you use the swap buttons that I designed! Post it anywhere, for example in your blog’s sidebar, your Facebook wall or instagram – I so appreciate that! Please link it to this very page! If you’re interested in a collaboration, let me know. You sharing the swap with your friends and followers helps me a lot, and I appreciate it immensely. Thank you! If you have a blog and write about your art process there, please share a link to that post in the upcoming link up post on my blog. Also feel free to take photos (or to scan) finished postcards and share them in the Postcard Flickr Group! There is no need to tag me by name in every photo or tweet you share, I’ll see it if you include the hashtag #diypostcardswap when posting on social media like youtube, instagram, facebook or twitter! If you’re on Snapchat follow me - I’m @ihannanu. You don’t need to have a blog to sign up, nor do you need to share anything online – but it would be nice if you took the time to be supportive in our creative community (commenting, making extra cards for those who don’t get all of theirs etc). Swapping is about being a part this awesome group of people who loves to swap too! Thanks for visiting other participants, spreading your creativity and leaving encouraging comments etc. Include your email if you want to be contacted/thanked by the receiver (connect with each other! ), that is much appreciated by most swappers. It’s much more fun to get a postcard from a fellow human being than someone that reminds more anonymous. Free printable postcard backsides – download the pdf and print away! 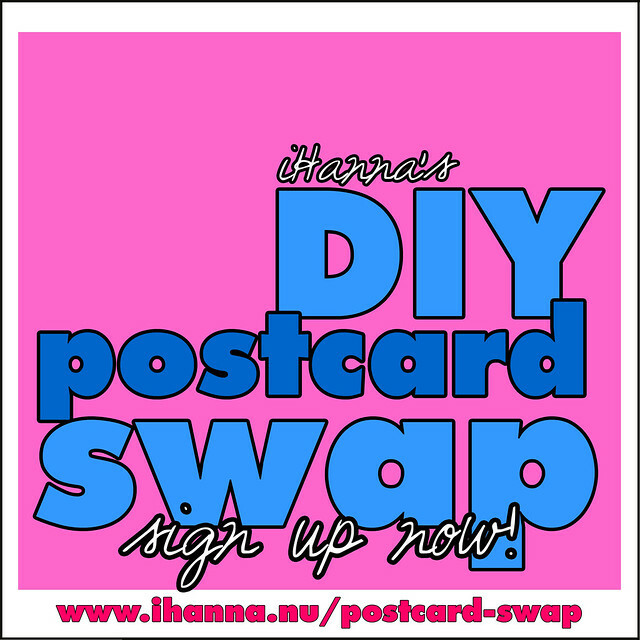 DIY Postcard Flickr Pool – join and share your scanned or photographed postcards here! 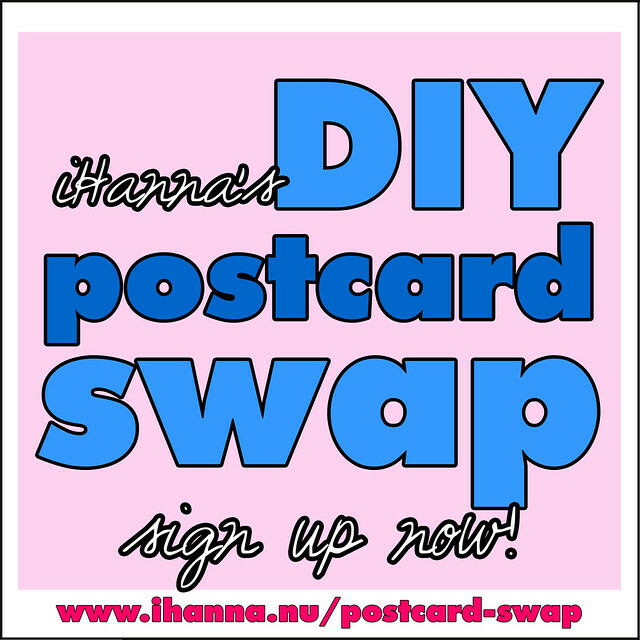 the iHanna Newsletter – sign up if you want to swap handmade postcards next time too! I send it out only a few times each year and you will be informed of all things new and cool! 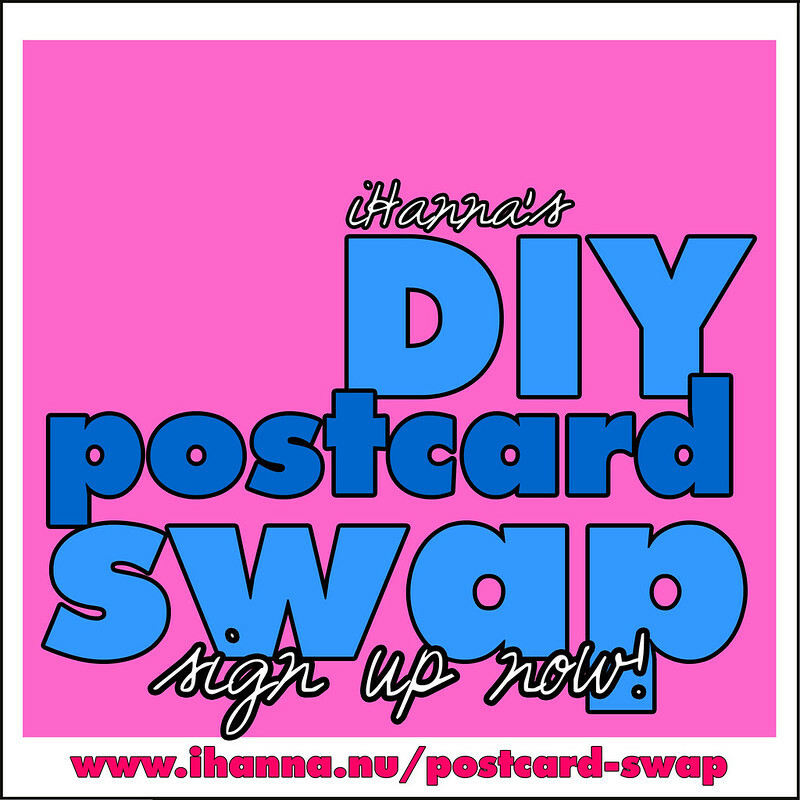 All of iHanna’s Postcard Posts – take inspiration from me, because I have created postcards for years! 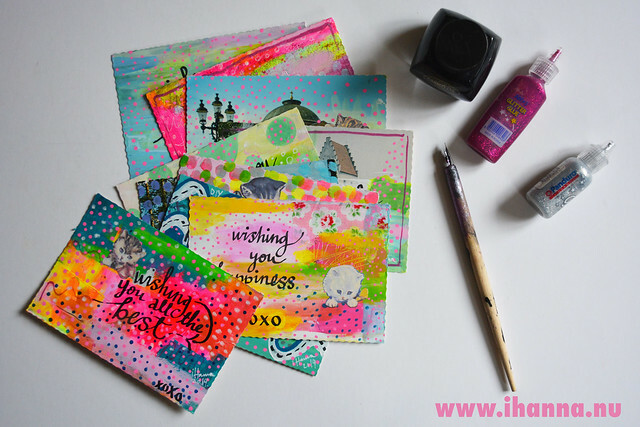 Lets glue, cut, paint, sew, stamp and write postcards! 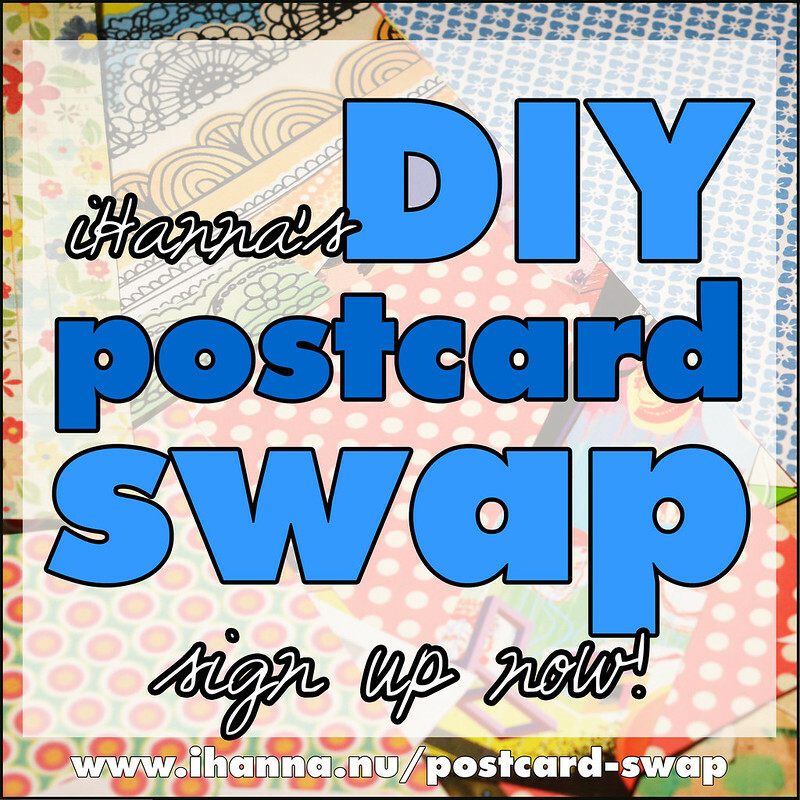 iHanna started the first swap in spring 2010 and since then it’s grown a lot. 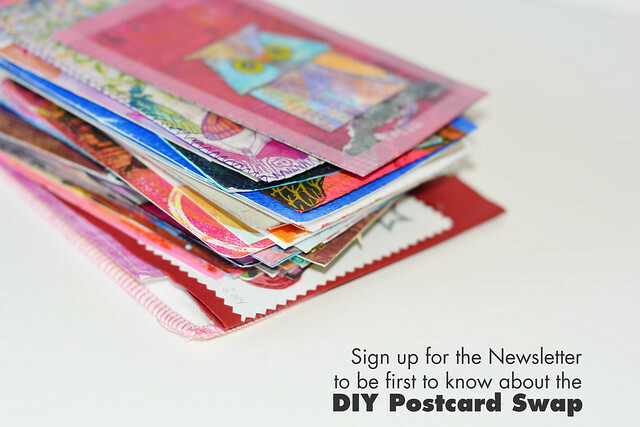 In fall 2015 we reached the 6th year of the DIY Postcard Swap – and we’re continuing. Up until then there have been 10 swaps and over 10.000 handmade postcards generated though this swap, and after that even more. That is not bad, for keeping the postal workers busy! On our second year a whopping 2800 postcards were created – the record so far. Spring 2014 more than 200 participants singed up and in spring 2016 we were 180 participants. In the DIY Postcard Flickr Group, started the 4th of February 2010, you could find 2,160 photos and 320 members a while back, and even more today. Most participants are from the states, then Scandinavia and Europe – but we have had people from every continent joining at one time or other. This is truly an international swap. Your hostess, Hanna, is from Sweden. You can read more about what goes into the swap here and a bit about sustainability here.